Windows 8.1 was released the other day, and sure – that news was pretty exciting for PC owners. But that’s not the only newsworthy product Microsoft has up its sleeve for this week. Today Microsoft announced the launch of Microsoft Remote Desktop, its own iOS and Android app that lets you connect to and use a Windows 8.1 Pro PC right from your smartphone. Unfortunately, the procedure to actually use Remote Desktop is needlessly complex. You’ll need to configure your PC’s Control Panel to allow remote connections, and then you’ll need to type “ipconfig” in the command prompt to get your computer’s IP address. One would hope that an official Microsoft product would be a bit more frictionless, but as we've seen in the past, official Microsoft apps for iOS and Android tend to disappoint. While it’s great that the Microsoft Remote Desktop app is free, you can only use it with the more expensive (and unpopular) Windows 8.1 Pro operating system. That said, you’re probably better off with a third-party remote access solution like the popular Splashtop app. It’s not free to use, but it is compatible with non-Pro versions of Windows 8. 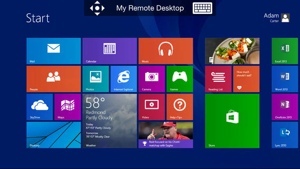 Microsoft Remote Desktop is a free download from the Apple App Store (iOS) and Google Play (Android). Pricing for the Splashtop app varies depending on your exact needs; visit the Splashtop app download page for more details. But how can I use this remote desktop connection? i am confused. I installed windows 10 and tried it. But, its not working properly? What may be the reason?? Please help. thanks for sharing this amazing post with all of us.i have tried the method from the article it worked for me.